… is that the mortgage rates came down considerably since we bought the place. When we’ve signed up for homeownership (or “became slaves to the bank” if you’re a glass-half-empty kind of person), rates were hovering around 4%. That meant that 4% of our mortgage would be forked over to the bank every year for the privilege of living here. Now the rates came down even further, and we’ll be lowering our slavery price tag to 2.59% which means we can either pay the mortgage off faster, or direct the extra savings towards an expensive habit like drinking Starbucks coffee every day or buying puppies. Side note: By the way, if one of these days you feel extra happy and positive and would like to get back into more down-to-earth mood, crunch the numbers on how much of your mortgage payment is going towards interest and how much actually pays down the principle. 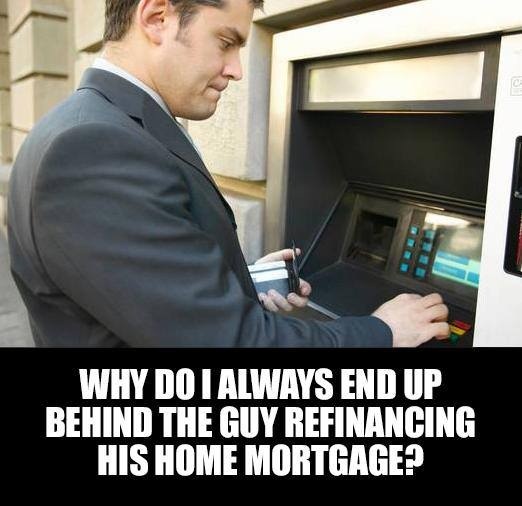 It’s rather sickening – especially if you never increase your mortgage payments. … is that the fact that the process of borrowing money became very restricted since we bought five years ago. Perhaps my memory is starting to fail me, but I don’t remember this process being this painful. It’s like a fiscal rectal examination now. Five years ago all we had to provide to a mortgage broker was our most recent T4 forms. He looked at them, verified our income, and said we should be fine. Two days later he faxed us (why do I still have a fax machine?) the documents, and boom – we were homeowners. Cool potatoes! – Blood and urine sample. Fine, I made the last one up. But seriously, it’s rather intense. And it’s not like it’s hard to get all of these documents together, but the sheer difference between obtaining financing today and five years ago is rather stark. Feels like five years ago they were giving out money to anybody who could fog a mirror, and now they’re actually verifying details of your income and actually making sure you’re able to make the payments. What gives? Oh, I get it. The whole credit crisis and how few people lied about their income and caused a bit of a recession. Buying homes was a cool thing to do. Home buying shows were on every channel, everybody was an expert on housing market. University students were buying condos instead of renting them because real estate was only going up and up! Nobody wanted to miss the moment and be left behind the rising home prices. Then some people missed their mortgage payments. Then some houses got foreclosed. Some banks went under because they didn’t verify incomes of their lenders; some financing companies lost half of their capital due to bad lending practices. Perhaps, it’s a good thing they have all these restrictions now. Perhaps, filling out all the paperwork and requiring a long list of documents is prudent. But still, it’s pretty intense. So, make sure to start way ahead of the schedule, and not wait till the very last minute like some people.